I built this website because I've done a lot of fun things in my life and I thought that you might get a kick out of them as well. Click around it and see. Have you done any fun things in your life? Are they similar to mine? Is your sense of humor similar to mine? Go ahead, find out. A lot of my fun came from travel and a lot of that came from my Harley, my travel trailer and truck and my vintage 1978 MGB. Therefore, you may want to head over to my Fun Travel page and see if you can relate to any of my adventures in those areas. A lot of things in my life that caused me to smile, have come from jokes that people have sent me and so I gathered them all under one heading - "Fun Jokes" and then tried to categorize them into different areas so that you could zero in on anything that was of particular interest to you. Visit this page and look around for things that make you smile. If you're into comics or funny pictures or posters or videos, then the above page is where you want to start. So go ahead, click here and check it out. I've done some interesting things in my life and so I created this area for you if you are a "doer" and prefer to get your fun through activities. For example, I play a 12-string guitar and try to sing old rock and roll songs, so if you want to join me, I've made some videos (with lyrics) so that you belt them out as well. I've made funny email templates that you can use if you want (although not many people send email any more). I've also spent a lot of time leading groups, and wrote a book about that if you're a leader in need of some "Familizing" ideas! I've even used this area "tongue in cheek" to describe my "FUN" hospital experience, so you can see it has some variety to it. Any thing that I couldn't fit into the categories above, I put on this page. (Things like: "Who Am I? ", "Links I Like"). Have a look. Don't Miss Out - The Updates Are Free! 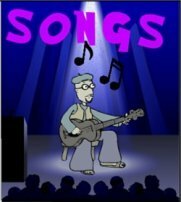 Sign up and get notified every time I add fun things or release a new singalong song onto my site. I don't know how my sense of humor and yours mesh, but try it for a while and see. If we "click", then you'll get some free smiles without having to search for them. If we don't "mesh", then just opt out and I'll be out of your life. All I need is your first name and an email address (below). Click On BLOG (Below) To See What People Have Received Recently! What Other Fun Things Are Happening In The World?